Halloween always makes me crave watching Harry Potter. I love Harry Potter – especially the magical butterbeer. 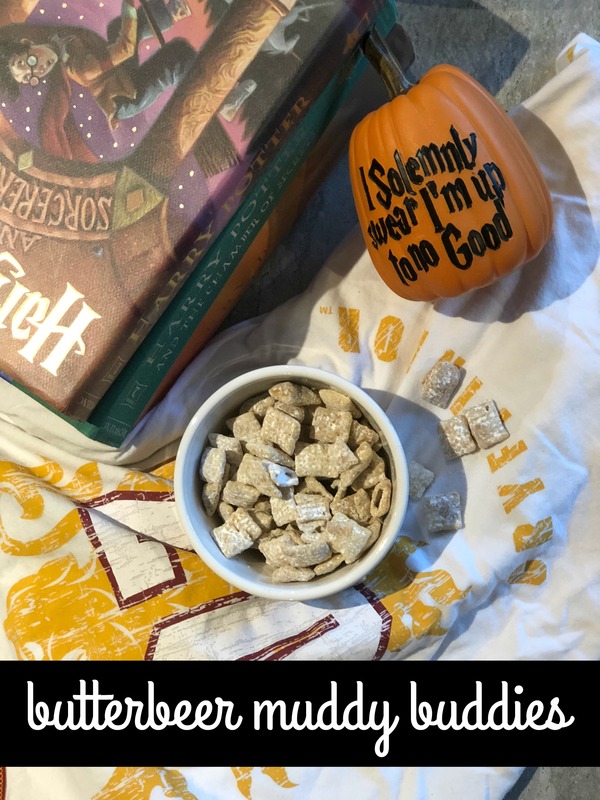 We had some when we went on our trip to Orlando, so I decided that I definitely needed to make this sweet treat for a Halloween snack. // In a medium microwave safe bowl- add the butterscotch chips, vanilla and imitation butter flavor. Heat in microwave for 30 second increments (check frequently to avoid overcooking, as that will cause your butterscotch to burn). Do this until the mixture is melted and smooth. // Dump the mixture into the bag with the cereal and shake to coat. Spread on a cookie sheet and allow to cool. // Once cooled, add the mixture bag into the bag and add the powdered sugar. Shake again to coat – then add the Toffee bits and shake again. Serve during your next viewing of Harry Potter – or really any time you want a sweet treat. I hope you have a batch of this waiting for me! This sounds AMAZING! !